If the house has animals and plants, then do not leave anxiety for both, and for others. Green flowerpots suffer more: sometimes animals throw them to the floor, breaking pots and breaking shoots, sometimes – they decide to “have dinner”. But animals also get: “dinner” from a harmless to the appearance of a houseplant can be poisonous for them. How to equip the territory so that animals and plants coexist peacefully on it? First of all, you need to try to have these two dear to the person kind of pets (green and owners of paws and tails) “communicate” only at a distance, which means you have to deal with the safe location of plants. The best places for them in this situation are wall shelves, pots. If there are a lot of colors, and they have to be placed on the stands, slide them to the wall and fasten them (on the floor or wall). In the matter of eating plants in animals, curiosity does not come to the forefront. Firstly, a cat or a dog wants a “green”, if it lacks vitamins, and in that refined food, which we feed our animals, they are just not enough. Therefore, if you saw that your animal encroaches on your plant, go to the veterinary pharmacy – for vitamins. In addition, animals with the help of vegetable fibers elementary cleanse their stomach from their own hair, which they licked, inducing daily hygiene. This is especially true for long-haired pets and all – during molting. Fibers of the plant will bind the wool to the stomach in a lump, after which the animal will be easier to regurgitate. To protect houseplants, it makes sense to grow special grass in boxes. With the problem of gastric purification, cereal grasses help best. In pet stores you can buy their mixture and arrange a small “lawn” on the balcony or in the room. If in your area such mixtures are in short supply, you can sow ordinary oats or parrot feed. “Sowing” is usually carried out after 1-2 weeks – depending on the appetite of the animal. By the way, if there is no fresh grass, the cat or dog will chew dry, so that in the summer you can prepare a little “hay”. It will not be superfluous also twice a week to give animals 1-2 teaspoons of sunflower oil with food – it also helps to cleanse the stomach. It is real to teach animals not to touch plants. Of course, we will have to work with them, but gradually the training will give results. With dogs in this case it is easier to cope, but it will take a long time to get a “civilized” cat to behave. 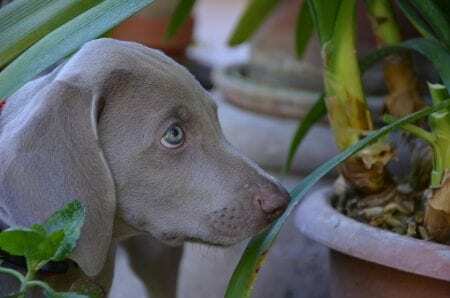 Animals have a very sensitive scent, so while your pet is not accustomed to not pay attention to plants, it makes sense to use special odorous agents that will make it bypass the place where the plants are located, by the side. Such funds can now be bought in a store specializing in animal products. Only make sure that on the package with the product it is indicated that it is intended for indoor use. There are odorous deterrents for household plots, if you spray this in the house, then you can not sit in it – the smell will be too strong. 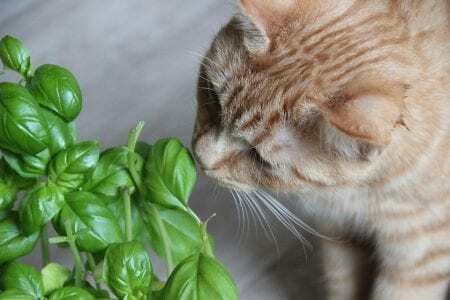 Means for enclosed premises smell are very thin, but animals it well smell. From folk remedies you can use chili powder: pour on a teaspoon in small saucers and arrange them between pots with plants. Medical alcohol is also not liked by animals, soak pieces of cotton in it and lay between pots: long after the cotton wool dries, the animals will smell it. Both dogs and cats do not like citrus. You can lay between the indoor plants crusts of oranges, tangerines, lemons (just do not forget to replace them with fresh ones from time to time). Experienced growers, who have to share their house with plants and animals, protect their green friends with a barrier of pots with indoor citrus trees. 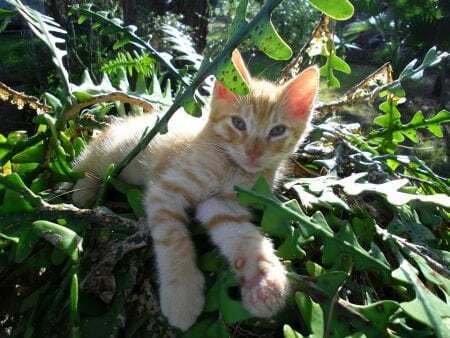 If you do not let the safety of pets on their own, then surely there will come a day when you no longer need to protect neither plants from animals, nor vice versa – they will learn to live together.